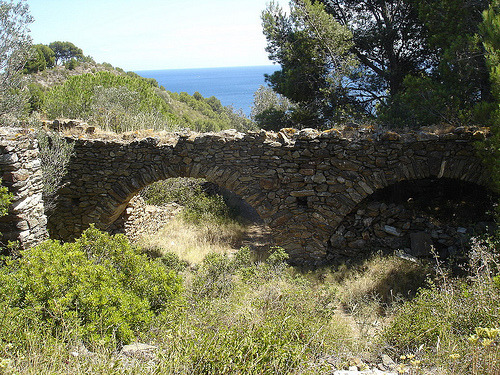 Located in the village of Roses, on the same road that leads to Cala Montjoi, in the Natural Park of Cap de Creus, this is an absolutely pristine creek that surprises the bather for its exuberance and excellent natural environment. 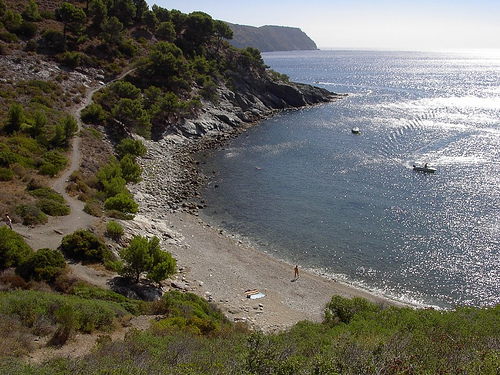 Cala Murtra is one of the most pristine coves on the Costa Brava. Its geographical location is privileged, and there is no doubt that for those who love quiet coves, this is an opportunity not to be missed. The cove is located about 7 kms from the center of Roses, taking the road of Cala Montjoi, completely paved. At this point you must be vigilant, on the right side of the road, indicating the panel down to the cove. Park here, on an unpaved space on the edge, and begin the descent through a path not well conditioned nor well marked, truth be told, without much slope or danger and that in 15 or 20 minutes will take you to the cove, which you will see as a visual reference along you descend, when you contemplate the brilliant blue waters under the clear blue sky and beyond the green of the pines that surround this natural setting of Cap de Creus Natural Park. Cala Murtra has no trace of human influence, there is no building around and has not even services dedicated to bathers (not even bins, so you are requested to carry your litter generated during your stay in the cove). 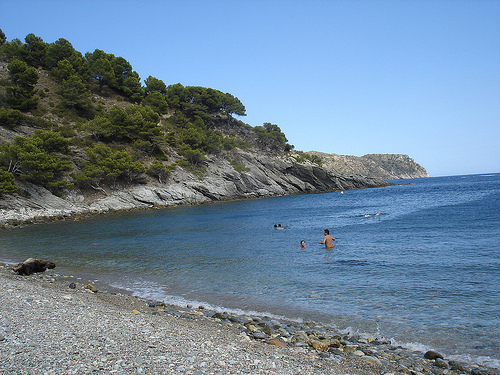 Cala Murtra is just that: a creek, and human presence even in summer time is usually minimal. The cove surface is not sand, but pebbles. It will certainly difficult to walk barefoot. The surface under water, almost of transparent and turquoise colors, combines sand with rocks at a time, showing the diver underwater vision alive. Moreover, Cala Murtra is surrounded by cliffs and is oriented slightly north (you can see in the distance Cap Norfeu), so that in the days of Tramuntana wind blowing it doesn’t offer much protection. 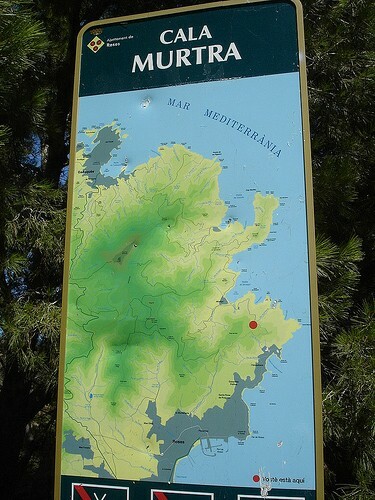 On one side lies the Cape Trencat, easily distinguished by its red color tones on the rocks, and the other the Cape Blanc, as its name (white) indicates lighter colors. Near Cala Murtra there are two more spectacular coves: Cala Lledó, south, and Cala Rostella, the next cove north of Cala Murtra. 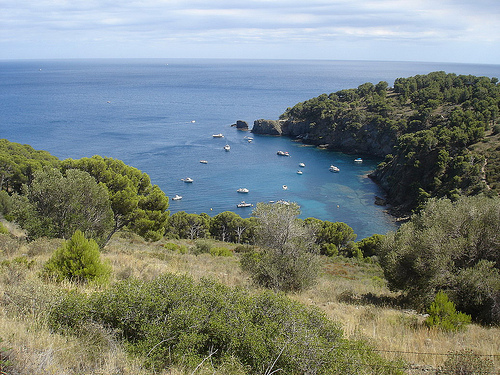 In any case the scenic beauty of the cove, surrounded on all sides by pine forests, is ravishing. Cala Murtra, horseshoe shaped, is about 150 meters long and 10 meters wide. You may be facing the creek, which allows the practice of nudism, find some moored boats: it is certainly one of the most favorite beaches for boats for ease of mooring. However, indicated buoys separate bather areas and it is prohibited by any engine boat to surpass them. Since 2009 this cove is awarded with the European EMAS environmental certification and the ISO 14001 international environmental management, so that the quality of its waters are secured for the enjoyment of visitors.